Long after the crowds have gone home, Cars Land remains in a lit Christmas splendor. The neon, the lights, the cars-themed holiday decorations... they all stand in a festive garland of season's greetings and spirit. The peace that pervades during this late hour contrasts sharply with the hustle and bustle of the operational hours, but it's a soothing, tranquil sight to see Cars Land devoid of people, yet still so dazzling in this festive delight. 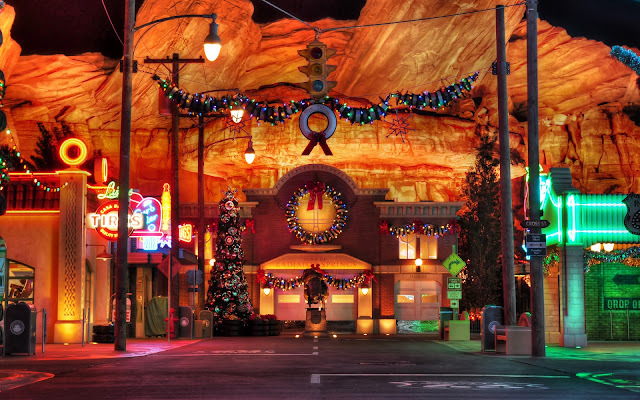 Midnight in Radiator Springs, during Christmas.